I have been a fan of Keren David for a while. Her stories are always really engaging and I oten find myself reading them in one sitting because I can't put them down. This book was no exception. 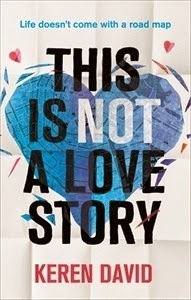 I loved This is not a love story from the first page. for a variety of reasons. Firstly it is one of those books that has made me to want to book a trip to the place where it is set for a holiday. This book is set in Amsterdam focusing particularly at the many British people that have made it their home. It describes Amsterdam as a really fascinating and beautiful city which I really want to go and explore now. I loved the story of Kitty. Kitty is 16 and just moved to Amsterdam for a new start with her mother. From the first page you really feel for her. She has had it tough over the past few months and is in a really fragile state and going to Amsterdam really gives her a new lease of life and a chance to find out more about who she is without her past hanging over her. This story has a bit of a love triangle thing going on without being the real focus of the book and I enjoyed that whilst it was part of the story it wasn't the be all and end all of the story. I also enjoyed that the love triangle wasn't a straight forward and featured a bisexual character. To my mind more diverse characters are so needed in YA fiction as role models for teens to tackle unhelpful stereotypes. The story itself had me hooked and I needed to know what was going to happen next. All in all an awesome read which I would thoroughly recommend.